Abraham Lincoln. Aura Reading, What Made Him Tick? Can you believe that America’s Civil War is, officially, over? Can you believe that the Confederate flag was part of the losing side? And that the Confederates actually lost? Yes, it’s a fact. 150 years ago, actually, is when the Confederates lost. Look, I love my country, and I love our First Amendment freedom of speech, but really. This is beyond ridiculous. Only now are certain state capitals removing their Confederate flags? Only now saying buh-bye to vanity license plates with Confederate flags? Gee, reading today’s headlines about Confederate flag lovers in Mississippi, a certain phrase comes to mind: Civil War Sore Losers! Well, I’m not about to protest in favor of the Confederate flag. Today I’ll lodge a different form of protest by reading the aura of President Abraham Lincoln, one of my personal heroes. He paid a terrible price for keeping America one nation, indivisible. And that price was not only his death by assasination. We can learn something about that from today’s article, a comparison aura reading. 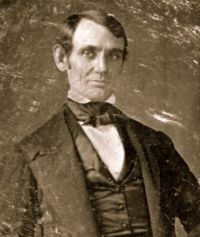 Using Stage Three Energetic Literacy, I’ll contrast a photo of him early in his life with a picture taken later: America’s only Civil War president. Blog-Buddies, I’m still playiing catch-up on our most recent contest, What Could Possibly Make This Person Tick? There I made a promise that I don’t plan to ever make again at this blog. I offered to do a reading on every single nominee of every person who entered the contest. Wow, does my heart leap ahead sometimes. Still, I’m going to follow up. A commitment is a commitment. Abe Lincoln was nominated by Blog-Buddy, and Enlightenment Life Lister, LARA. Now, if you would like to do research on your own, you might wish to scroll down to the end of today’s article for nuts and bolts. I’d recommend you do that before reading my aura research. That way you won’t be influenced by it. Your perceptions are equally important for learning about the multi-faceted diamond that is ANY human soul. Incidentally, I have already done an aura reading movie review of Daniel Day-Lewis in his role as Lincoln. 43 feet. Strong connection to his body and surroundings, tempered by a salty sense of humor. 20 miles. Objective reality is a kind of battlefield, stinking of carnage and echoing with screams. By this time in his life, Abraham Lincoln has adjusted to this as his default experience of life. My comment, related to the quality of this chakra databank: Long before the Civil War, his wife Mary had taught Abraham Lincoln what it is like to love someone who lives in a human version of hell. Making an everyday peace with this love relationship has been excellent training. Lincoln has learned how to hold a United America in his heart and soul, loving the nation despite the torment inherent in that particular love. This reminds me of the training President Franklin Roosevelt received in his human life from dealing with polio, long before he needed that amount of strength and more to lead his nation during World War II, a powerful World Server. 18 feet. Very aware of other people’s reactions to him; a showman’s sense of being on display; an actor’s acceptance of self-consciousness without strong inner distortion. Abraham Lincoln is aware of many shades of truth. He selects the version to suit any particular situation. Researching this chakra databank, the strongest experience for me is how President Lincoln has learned to push down his personal pain and fear, suppressing it again and again. This is not a once-and-done type of denial. This struggle, with its reflexive non-expression of pain, appears to occur during Lincoln’s waking hours… as regularly as a heartbeat. 85 feet. Tremendous ambition, a forceful driver of his personality. Abraham Lincoln seeks power. He is impelled from within to use speech and action to get what he wants. In this chakra databank, I also notice an ethical imperative that Lincoln feels he must follow through on whatever he has said that he will do. 90 miles. Walking circumspectly, and with dignity for the benefit of onlookers… in a land of death. Greatly intensified here is the earlier experience of battlefield, as I noted in Abraham Lincoln’s Root Chakra Databank for Connecting to Objective Reality, dating from this time in his life. Yes, it’s one thing to keep your balance, personally, in a situation of nightmarish horror. It takes even more focus to move forward forcefully, persistently doing your best version of what is right. Technical point, readers: As you may know, every major chakra contains 50 different chakra databanks. This one is just about the stability of Abraham Lincoln’s emotions at the time of the photograph. 18 feet. Abraham Lincoln lives in a serviceable state of emotional stability, his own trademarked workaround. Emotionally he has struggled enormously. Mostly, now, he lives with emotional detachment. Strong emotions break through sometimes, as if the sun were shining out from a mostly cloudly sky. 25 feet. Every day there is new struggle in order to continue living. Abraham Lincoln won’t quit; he just is so very weary of every day’s struggle. 50 miles. Abraham Lincoln has an exceptionally graced connection to Spiritual Source, taken for granted by him because this is all he has known in this lifetime. Regarding integrity, Lincoln’s sense of right and wrong comes instantaneously. He doesn’t stand in the way. He follows through as best he can. This is part of the deal for him, spiritually. Note: In Enlightenment, something similar is part of the deal. 90 miles. If that golden inspiration did not sustain him, Abraham Lincoln couldn’t make it. However, he is given just enough to continue, one day at a time. And sometimes, intermittently, there will be extra moments of joy. Spiritual integrity, like everything about Lincoln’s connection to Spiritual Source, is The Core Value. Note: His connection to the Divine is not like Enlightenment, or like Awakening experiences that are so common now (in the Age of Awakening). Rather, this is a spiritual connection from such a different time in the world’s collective consciousness. And, for that time, what he has is unusual, a special gift for Abraham Lincoln. Making life easier. Although never easy. Why wasn’t Abraham Lincoln given even more bliss, more joy, from a more intense Enlightenment-style connection to Spiritual Source? He would not have been as effective. What sets me thinking this way? Yesterday I brought someone new onto my Enlightenment Life List, the spiritual teacher Jean Christian. What a beautiful, beautiful being — impressive to this aura reader! When I looked at her website, I continued to have the utmost respect for her. Yet I felt so grateful that, just as Jean has her work as an Enlightenment Coach, I have mine. For me, it is so important to have intimate contact with human pain and growth in the ways that I do; a different kind of identity strongly permeated by the Divine, but one with much more human stickiness. Compared to Lincoln, I’m like a thimble holder, while he commands an ocean. Still, it does seem to me that there is need in life for those of us who live with humanity as the strong motivator, and light more as the totally dependable support. There is a beauty when some of us hold only as much joy as we can contain… and still be able to effectively live out our role in this world. If bliss predominates at your current level of consciousness, more power to you. If human context predominates at your current level of consciousness, more power to you. Truth is, your path is your glorious path. A one-time privilege. In this incarnation YOLO. Which photograph am I using as a basis for today’s aura reading? This is Lincoln’s full-sized aura photograph. This is the full-sized aura photograph of Lincoln. Yes, to an aura reader with Stage Three Energetic Literacy, every photo is an aura photo. What if you want to read President Lincoln’s aura too? Whatever your current level of energetic literacy, you Blog-Buddies are invited to join me by doing your own aura reading, using the same photos used here. Or substitute a Skilled Empath Merge, using the “Magic Picture” technique in Become the Most Important Person in the Room (Start on Page 201, if you’re reading the paperback rather than the eBook). Many of my students who want to use their lifelong talent for reading auras prefer to start with the 100+ techniques in my how-to, Aura Reading Through All Your Senses. One way or another, it’s fascinating to use energetic literacy skills to learn about one of America’s greatest presidents, Abraham Lincoln. * Contest / * Energetic Literacy / Aha! Rosetree Energy Spirituality (RES) / Read People Deeper / RES Energy READING Skills Abe Lincoln / Aura / chakra databank / Civil War Sore Losers / Confederate sore losers / empath aura / energetic literacy / Read People Deeper / what makes him tick? Fascinating, as these always are! I love this reading Rose. What a fascinating man. I love your comments about his “training” prior to the Civil War–through his relationship with his tormented wife. It is interesting to me how often that is true in life. I also find it interesting the concept of situational truth: I can relate to seeing many shades of truth and selecting the most appropriate to the situation. Ah, Rose, your conclusion hit me where I live. Thank you for writing this. I really enjoyed this one (as is so very often the case). And I found the first three paragraphs hilarious! And, oh so true! This planet earth and inhabitants can be really interesting sometimes! How wonderful you are doing this now. Interesting to see how all data banks increased in size over the years. God knows he needed it. I don’t think any President ever had it tougher. I am currently reading “Our Man In Charleston,” about a British consul who became a double-agent in the years before the civil war. Hoping to get the author on my radio show soon. Even my husband was very interested in Abe’s aura reading. I read your article to him last night while he was making supper. Thank you, Rose, for another fascinating example… I really learn a lot from these. Thank you, Rose. This whole post moved me deeply. Such a fascinating and inspired aura reading. Thank you, Rose. Interesting to me was how much strength, purpose, and spiritual support it would take to persevere during such weariness and hardship. Wow. A world server well-equipped to do the job at hand in this particularly difficult, particularly significant lifetime. So interesting! Thanks for doing this reading, Rose. Thank you for this fascinating reading and including the comparison between two times in his life! Hmm, interesting. Firstly, this answers my question about whether you can do an effective aura reading from a black and white photo, especially early black and white photos. Such a relief, right, LILIAN? It doesn’t even have to be a good photograph, so long as it shows (from a front angle) the areas of the body corresponding to chakras and sub-chakras. It’s true that sometimes I read auras from headshots. That is a skill of Stage Four Energetic Literacy, that I can teach you some time. But for so many, many practical purposes it will be just fine for you to read auras from photos that you find online or take for yourself. Thanks to all you Blog-Buddies who have been commenting on this post. Good to hear from you! Also, Rose you’ve mentioned the emotional growth your job requires three times now in recent posts. So as a skilled empath who is also enlightened, it’s still demanding to experience the pain of others through empath skills, however advanced those skills are. As an empath, we can experience all those individual life experiences as our own. And we understand them on a human level, as humans, causing emotional growth. The move away from traditional religion caused things like Law of Attraction, which again implicitly blames people’s feelings for why objective reality things aren’t going the way they would wish. Again, not the kindest of or practical of philosophies. However, any belief system that doesn’t value the particular suffering we have on earth does do people a disservice. It’s not because we are fallen, it’s just because we are human and are going beyond our comfort zone of self knowledge as souls.. So Rose, the subtleties that you’ve worked out in your own personal philosophy are significant. 🙂 They show the level of acceptance that you need about the human condition to become enlightened. This while everyone seems to be seeing the human condition as fundamentally flawed. Hello spiritual shutdown and spiritual addiction. Sorry for essaying again, but, what you are communicating about your path as a empath working in healing was very significant, I think. Everyone can develop skills, but who has the emotional courage to really develop them and to keep growing in their acceptance of the human condition? Not me right now! Much appreciation to you, Ms Rosetree. Thank for sharing your struggles Rose. Lillian, I just love all your comments here! You express things so well. Being a Seer — Does That Make a Person Holy?